It is with heavy hearts we announce the passing of Marie Lillian Scott. 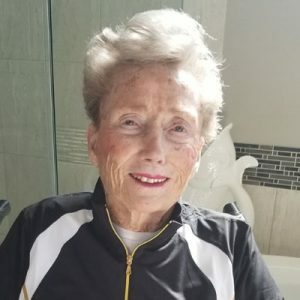 Born October 1, 1931 in Swift Current, Saskatchewan, she passed away August 24, 2018 at Cottonwoods, having suffered from Alzheimer’s. She is survived by her husband of 68 years Frederick Leonard Scott; her three children: Randy, Sandra and Patty; her 6 grandchildren; 7 great grandchildren and, of course her loving dog Jackie. Marie will be remembered for her amazing sense of humor, baking and love of each and every holiday. She will truly be missed by us all, especially at Christmas. She was always up for a game of Rummy and loved golfing, bowling and her poker girls. We would like to give thanks to the nurses and care aides at Cottonwoods. At the family request there will be no funeral. A Celebration of Life with the family will be held at a later date. The service for SCOTT, Marie Lillian is scheduled for At a later date. Below you will find the map for the service location and the contact information should you have any questions. My thoughts are with the Scott family. Fred we are sorry to hear of Marie’s passing after an amazing 68 years of marriage! We know you and your family will cherish many fond memoirs of Marie and our thoughts are with you today. Wayne and I are thinking of all of your family without the glue in your family of Marie. What a lot of memories we have of Marie. One special one is our mutual love of dogs. One day, I passed by Marie’s car and low and behold, her goofy spotted dog is sitting in the front seat, proud as can be. I took a picture, sent it to Marie…we had a couple laughs about that one. ; certainly not one antic her shepherds would have dared! Another great memory was drooping in unexpectedly on a Sunday afternoon with friends, just like in Saskatchewan and actually being welcome! Marie was one of a kind…she will be missed. Fred, Marie had to have been a special person in every ones heart that had the privilege to know her, she shared the spotlight even when Fred was arround. Marie was smart and no matter what Fred said we all knew she had the last say. We all loved Marie and knew the big jod she carried for 68 plus years, let’s give her a big hand. It was a life we admired while loving them both. You kids should be awfull proud of what you had and got to share. We always enjoyed meeting up and having a chat with Marie at the “mailbox” – inevitably she was accompanied by her much loved dog. Our condolences go to you, Fred, and your family. So sorry to hear of your Mom’s passing. I’ll miss seeing her at the Estée Lauder Counter and in the store with you,. Thinking of you and sending hugs your way. My condolences to the family. Marie always had a smile and kind word . Im sure Marie will be missed by a lot of friends and especially her family. I was sorry to hear the sad news.